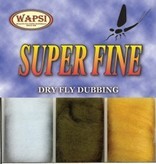 Super Fine Dubbing is permanently waterproofed dry fly dubbing. A 1.2 Denier, 1.5 staple synthetic material. Super Fine makes a fantastic tight body on dries down to size 28. The colors match the hatch perfectly. Superfine dubbing is the standard dubbing used by fly tiers around the world.